Scaling success requires enormously disciplined research, hard work, and creativity. Most ventures, both profit and non-profit fail. And that is because the entrepreneur is not prepared to take the organization to the next level. In "Scaling Your Social Venture," author Paul N. Bloom from Duke University's Center for Advancement of Social Entrepeneurship addresses the important basic questions: When does it make sense to try to scale a social entrepreneurial venture, what the scaling-seeking social entrepeneur should try to understand about the ecosystem in which he or she operates, and finally provides a step-by-step approach for assessing the organization's unique situation and interpreting what that situation implies for determining the most effective strategies for scaling impact. Bloom has created a unique model for understanding an organizations readiness to scaling including: Staffing, Communicating, Alliance-Building, Lobbying, Earnings-Generation, Replicating, and Stimulating Market Forces. 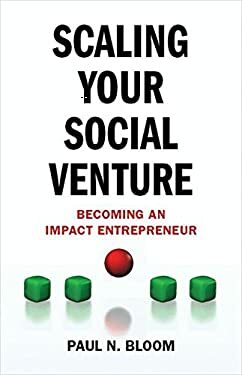 In today's volatile business environment, being prepared is critical to success and Paul Bloom can provide entrepreneurs with the knowledge to assess, plan for, and accomplish lasting impact in the field of social entrepreneurship. Used Good (2 available) Former Library book. Shows some signs of wear, and may have some markings on the inside. 100% Money Back Guarantee. Shipped to over one million happy customers. Your purchase benefits world literacy! New (117 available) BRAND NEW. Over 1.5 million happy customers. 100% money-back guarantee. Make your purchase count: support Better World Books' worldwide literacy partners.